I love TV. I love it so much that I harshly judge people based on their viewing habits. I’ve ended relationships because of disagreements over which Iron Chef series is better (original, duh). So I take TV very seriously. I also watch a lot of TV online or via Netflix because, you know, geek. I finished Dexter season two months ago and was really looking forward to starting season three, which just came out on DVD. This is all background information for my griping. 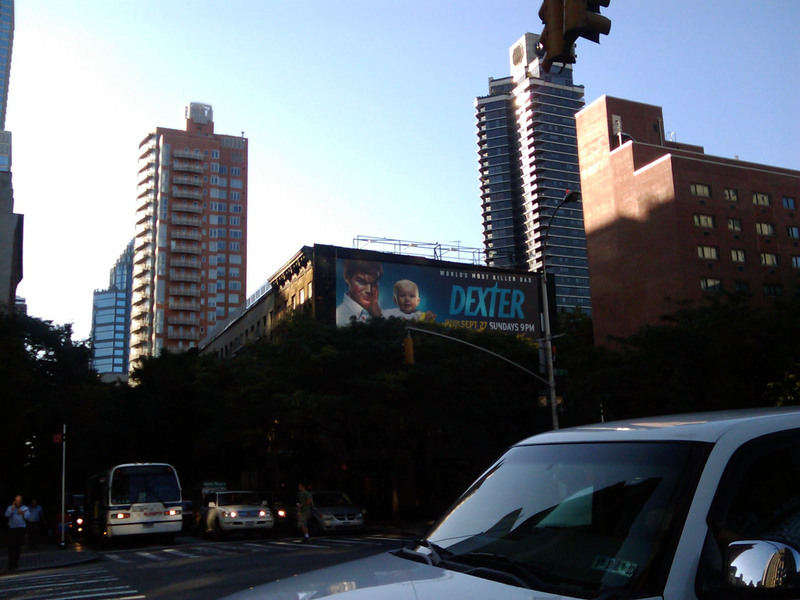 Y’all in NYC have probably seen these promos for Dexter season four all over. It’s in the subway and on buses and, I dunno, stuck to the backs of the doors in women’s rooms. And it pisses me off because it’s like a giant spoiler that’s following me everywhere! To those unfortunates I say: LOOK AT THE COPY. It’s not like this baby was a secret; I’m told there was a special behind-the-scenes episode about this plot line. But I had gone to great lengths to avoid those things. Copy, on the surface, seems to have very little to do with my spoilery anger. But allow me to make an incredibly far reach. I believe that all copy, even ad copy, should consider its audience. Not its intended audience, not its target demo, but every single person who’s going to be looking at it. Obviously the ad dudes considered the people who might be offended by the image of the baby with a serial killer (oh, spoiler alert, if you haven’t seen season one: Dexter is a serial killer). Why not also consider the people who would be offended by spoilers? Why not just let that image and the show logo speak for itself? Why the annoying little pun that destroys all the mystery? Who is this ad for? All the people who are caught up on the show and already know about the baby? All the people who are only vaguely familiar with the premise of the show and love babies? What about me in the middle ground, yo? Where’s my Dexter ad? I want to preface this piece by saying I love Twitter. Maybe not as much as I love my wife, or baseball, or even a good burger, but I enjoy the opportunities Twitter provides: learning about people through discussion, learning about brands, getting information that I normally wouldn’t think to research, etc. However, Twitter is also a great study in human behavior, as Twitter is just a microcosm of our society whereby the cliques that form on Twitter are for the most part the same cliques that are found in high schools. This has become more evident since the passing of John Hughes. As I watched my Twitter stream recite quotes from his coming-of-age films, I started to view Twitter as nothing but a social media breakfast club. In fact, I’m writing a post on a blog called: PR BREAKFAST CLUB for crying out loud! In January of this year, I made the conscious decision to at least TRY to go to one industry event a month. So I find myself at some place where a bunch of people are on a stage playing a game; I believe it was a “guess that meme” game. And as I’m standing in the back, nestled between the bar (ironic since I don’t drink) and a few people I’ve met over the years, it strikes me that I’m bored. And I’m bored because the people on stage are clearly having a great time, only I don’t understand why. Turns out, it was all a gag…all inside jokes that if you had no idea who these people were (like me) you wouldn’t find it funny. So I left. I understand these lists are for fun, and the creators of these lists make that point very clearly. But there are a lot of periphery people who use Twitter (not to mention the overzealous, self-important, vapid self-promoter who uses these lists as an opportunity to say how great they really are) who don’t know this. Even more important is that this philosophy of fluffing up your online buddies diminishes the overall value of the content provided by these people; mainly because there are always people that will be let off a list. These lists are emblematic of a culture that needs constant approval to validate their existence. (Hell, a study was just completed where 57% of young people believe their generation uses social networking sites for self-promotion, narcissism and attention seeking.) Now, this is not to say that we’re these narcissistic vultures who provide no value to anything and just let the drivel drip from our fingertips onto the keyboard. There is some value from these lists, mostly opening up new avenues of learning. The problem is that these lists are blinded by the little piece of world they exist in. There are some great people on this list, but how many of them are connected to each other compared to those not on the list? It just seems as if it’s a matter of who you know, not what you know. Where are the academics, the reporters (yes, there are a couple), the athletes, the thinkers, the movers, the VCers? Just because your world accepts that certain influencers should already be followed, the rest of the public typically has no idea who these people are. This is a myopic list at best and a sycophantic list at worst. But that’s the nature of lists, isn’t it? And you may have though throughout this rambling post, well, you’re not on the list and that’s why you’re grumpy. As Groucho Marx says, “I don’t care to belong to a club that accepts people like me as members.” On the flip side, please retweet this article so that people can read what I’ve written. In fact, I think I’ll post a link to this article every 5 minutes over the span of 24 hours just to make sure my legions of followers know that I’ve written something very profound.